Just did this velocity stack mod. and had trouble with the hose falling off the airbox neck. I just couldn't get the clamp to grab the neck securely even with the hose notched out, so with a littile bit of time in my bench grinder I profiled the clamp to match the notch in the hose. The assembly is very secure now. I also tilted the velocity stack on the hose as you can see in the photo so there is no clearance problem with the bodywork. Yes... i did this on my S. I used a 45degree silicone elbow which helped aim the funnel more towards the intake. This combined with a Green Filter makes the car rev easier and sound better. Definitenly nothing lost by doing this. Maybe a few ponies. This mod plus sports cat and 2bular DEFINITELY made a difference. Stan and I pulled out my Green filter yesterday after 5000 miles. We were amazed at how clean it was. My car has been on the roads with sand, salt, etc. In fact my car is down right filthy right now especially near the intake vents. She looks like it' is a two tone with grey on the sides. Well the Velocity stack still shines like new, and the Green filter was so clean that we desided to put it back in without touching it. Here's the picture of my Green filter after 5000 miles with the Velocity Stack Mod. You can see a little darkness, but when we held it up to the light, you could clearly see right through it. Stan and I desided to not replace it with my other Green filter, simply because a slightly dirty one will filter out more particles than a fresh one. Thanks for this write up Scotty. I bought the parts today at my local PepBoys Auto part store. Only spent a few bucks! I will post my pictures and thoughts when I put it on this weekend! 05 Saffrron Yellow, Sport, Touring, Star Shield, Larini w/ sport cat, Katana Supercharged, SSR Comps with RE01R's. In the end... for me... stock air box, green filter, removed snorkle, disabled air flap. what purpose does the air flap have? I bought the parts last week and will install this weekend. Who sells the green filter? Is this better than the K&N one? 'bout time someone helps us idiots out! thanks for the writeup and pix. '06 ELISE now with hidden talent and dual cigarette lighter sockets! As I understand it, the air flap is an emissions requirement. It opens when the engine is cold so that warmer air from the engine bay is used instead of colder outside air. I just did the mod, it was very simple, although I also put in a Green filter, closing the box was not easy. The sound is exactly what I wanted. When I first started driving, allowing the engine to reach temp, it was like a soft whisper in my ear everytime I accelerated. Once it was warm, I started running through the gears. I thought to myself it does not sound much different, then I approached the second cam, the soft whisper turned into more of a loud roar. It scared me a little, then I smiled and did it again . I love the sound. Others have reported very little difference, but my car is stock and it deffinately made a difference. Just thought I would report. I originally thought the same as you, but actually the flap opens when at WOT and/or High Cams to allow more air flow. It doesn't have anything to do with emissions. Or put it a different way... the flap closes when not on the upper cams, restricting air flow (and thereby also fuel) to reduce power levels (perhaps to increase mpg). There are some very shady dealers in the Lotus business. I have done similar modifications to other cars with great success. If you are willing to put up with the louder engine sound and REALLY want to increase power, try this. Remove the stock snorkle and remove the air box from the car. Use a coping saw to cut a large square hole around the snorkle hole. the bigger, the better. On my Jaguar S-Type, I made the hole 4 inches by 5 inches. On my Altima, I cut the whole end off of the box. Understand that this is on the "dirty" side of the filter. Opening up the intake like that will gain much more power. I would bet that it's up to 10 HP. Car companies are very concerned about engine noise and the snorkles are very resrictive. That includes the hole thay are attached to. I also like to use K&N air filters because I can wash them once in a while. 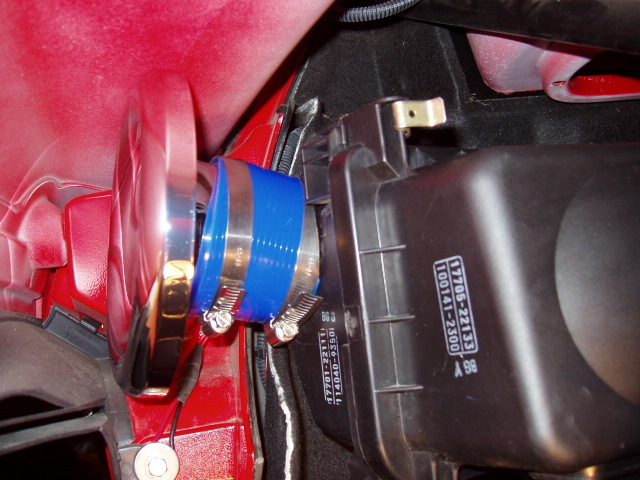 The little trumpet device will amplify the intake noises and make the engine sound louder. But, my solution will make much more serious power. Last edited by neckstrap; 03-26-2007 at 05:43 PM. But, my solution will make much more serious power. Sounds more like the Stage 3 intake solution from Lotus. Use a coping saw to cut a large square hole around the snorkle hole. the bigger, the better. On my Jaguar S-Type, I made the hole 4 inches by 5 inches. On my Altima, I cut the whole end off of the box. Understand that this is on the "dirty" side of the filter. Opening up the intake like that will gain much more power. I would bet that it's up to 10 HP. Not to be a pain, but do you have dynos to back that up? The reason I ask is because there's a great debate on another car list I belong to whether this does anything other than change the sound. Some argue, like yourself, that it increases airflow and thus gas flow. Others argue that it adds hot air to the airflow, which is less dense, so it can actually lower performance. All agree that it makes the car sound more agressive. Car companies are very concerned about engine noise and the snorkles are very resrictive. I also like to use K&N air filters because I can wash them once in a while. The little trumpet device will amplify the intake noises and make the engine sound louder. But, my solution will make much more serious power. Ah, but the Lotus ECU will learn-out any gains after a few weeks, as it does all the CAIs for the Elise on the market. The ECU balances the fuel and air level based on the exhaust temperature. If the intake is getting more air, the ECU will be happy to add more fuel. It does the same thing with mild NOS setups as long as you don't exceed the 100% capacity of the injectors. You may be right about increased air temperatures if the car is sitting still. However, once the car is moving at 40 MPH or better, the airflow through the intakes is gale force, blowing all the hot air through. I wish I had a dyno to prove it, but you really can feel the difference. The beauty of it, is the hole is up under the fender (in all three cars) and the smog inspector cannot see the change. If you read a lot of the automotive journals you find out that some manufacturers actually restrict the intakes to reduce power to make warrenty items (like transmissions) last longer. I don't know if Lotus is one of these. Honestly, the Lotus intake tube is not so bad. I would guess the snorkel is 1.75 inches inside diameter. The 3.0 liter Jaguar was probably 1.5 inches and the 2.3 liter Altima about 1.25 inches. However, more is always better, right? Last edited by neckstrap; 03-26-2007 at 06:04 PM. Isn't this how the Cup 255's intake is setup? I remember Jack posting pics and briefly talking about it. Where is Jack anyway? I haven't seen him here in a couple weeks. Use a coping saw to cut a large square hole around the snorkle hole. the bigger, the better. Just cut a big square hole? Attach nothing else? hmmmm...I guess I'll try the trumpet mod 1st. What you say is true for other cars. However, the Lotus ECU doesn't cooperate. It will go through a learning process to eliminate whatever you gain. There is PLENTY posted on this subject at this forum. Many people have changed intakes to something far more free flowing and get initial horsepower gains. Three weeks later, the gains are gone. You can open up the airbox as big as you want. The throttle body is still going to be the restriction to more air flow. Also the ECU will erase any short lived gains unless a reflash is accompanied. there seems to be a misunderstanding of what the ECU tries to do. it attempts to get the A/F mixture to a correct ratio. if you can feed the engine more air, the ECU will trim to the correct A/F ratio. it may see a slightly lean mixture temporarily, and this may appear as a HP gain, but as the ECU learns, the A/F mix will return to the correct ratio. that said, if you feed it more air and fuel mix, you still have more HP as a remanent net. the actual gain may not be significant but there IS a gain.